Our Patron: Blessed Mary of Providence. Thoughtfully the little group listened. That child, as Mother Mary of Providence, was granted in after years a very real participation in the mysterious sufferings of Purgatory and the way she spoke of them made older people pause and listen. The second episode happened on the feast of All Saints, 1853, that Eugenie Smet received a stronger reinforcement of her special vocation to the holy souls. As she was praying with her head bowed down before our Blessed Lord in the Sacrament of His Love, the idea of an association of prayers and good works in behalf of the dead was rising distinctly before her eyes. But then came the doubt - was it God who was inspiring here with thought or was it the result of her own fancy? In unhesitating faith she determined to ask Our Blessed Lord, by some unmistakable sign, to give a token of His Will. If you want me to begin this work my Lord, make at least one of my friends, think of something and let her speak to me about it as soon as I come out of Church. "Dear Eugenie, I am so glad to have met you. During Benediction I had an inspiration. I thought of offering to join you in doing everything we can during November for the Souls in Purgatory. Have you indeed had that thought?" The rest is history. 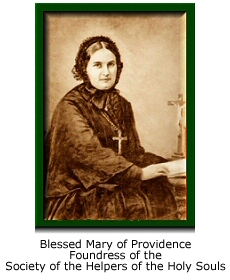 On January 19 1856 she founded the Society of Helpers of the Holy Souls in Paris, France. In Thee, O Lord, I have hoped, let me never be put to confusion (Psalm 70: 1)." The Father loves His dear ones in Purgatory.